Smørrebrød is a Danish open sandwich, and sol over Gudhjem is a variation of the dish from the Island of Bomholm. Smørrebrød (originally smør og brød, “butter and bread”) consists of a piece of buttered rye bread topped with fish, meat or cheese and finished with garnishes to make a visually appealing meal. Denmark is located in Northern Europe and has one land border with Germany. It consists of the peninsula of Jutland and 1419 Islands, with the main ones being connected by bridges. The capital city is Copenhagen, which is located on the island of Zealand. It is one of the Scandinavian countries along with Sweden and Norway. Denmark’s landscape has little elevation; on average the country is 31 meters (102ft) above sea level. Denmark’s terrain consists of rolling plains with sandy coastlines. Working arable land occupies the majority of landscape with rivers running through it. It has a temperate climate with mild winters and cool summers. Similar to the other Scandinavian countries, the traditional cuisine of Denmark mainly consists of meat, fish and potatoes. The dishes are highly seasonal, influenced by its agricultural history and geography, and its long winters. 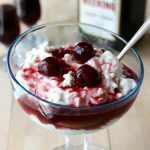 Gourmet cooking, influenced by French cuisine, was introduced to Denmark in the 1970s and since then it has evolved into New Danish Cuisine. New Danish Cuisine focuses on high quality local and seasonal produce, the most famous example is Noma restaurant which was voted the best restaurant in the world for four years. Smørrebrød, in its modern form, dates back to the 19th century. Lunch was the main meal of the day for agricultural workers and combinations of the open faced sandwiches would be packed for the day using leftovers from the previous night. The bread was used as a plate and discarded, but over time, the plate began to be eaten as well. 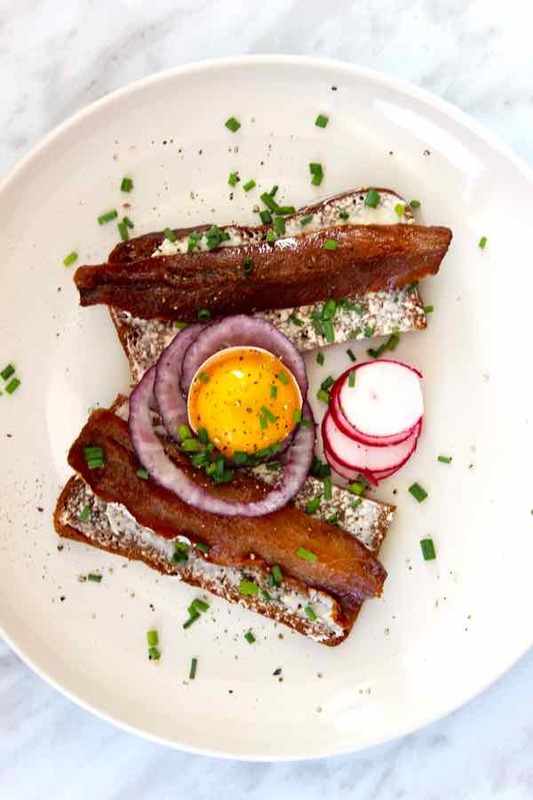 Smørrebrød are now an integral component of Scandinavian cuisine and they are eaten for breakfast, lunch and dinner and they are a staple at any celebration. The bread used as the basis of a smørrebrød is a sourdough rye bread. It has a soft but dense texture that has a slight sour taste to it. The bread is well buttered so that it doesn’t soak up any juices from the toppings. 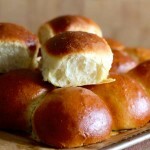 There are many variations of toppings, but the bread is the same in all traditional recipes. Sol over Gudhjem is one local variations of smørrebrød, literally meaning “sun over Gudhjem”, which is a city on the north coast of the island of Bornholm. It is from the island of Bomholm, where the river Gudhjem is situated, and it is known for its smoking houses. It consists of smoked herring, red onion, radishes, chives. A raw egg yolk is placed on top to symbolize the sun. There are many other variations of smørrebrød toppings. In fact, hundreds! 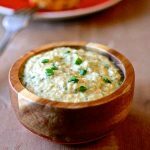 Some of the traditional options include eel topped with scrambled eggs, roast beef with sour cabbage, smoked salmon with shrimp and dill, and tartar with grated horseradish. 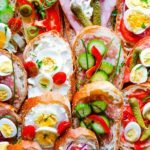 Variations of the open sandwich appear across Europe, especially in the Nordic countries. Modern, gourmet versions are beautifully presented with an array of garnishes and everyday toppings tend to be simpler and less fussy. 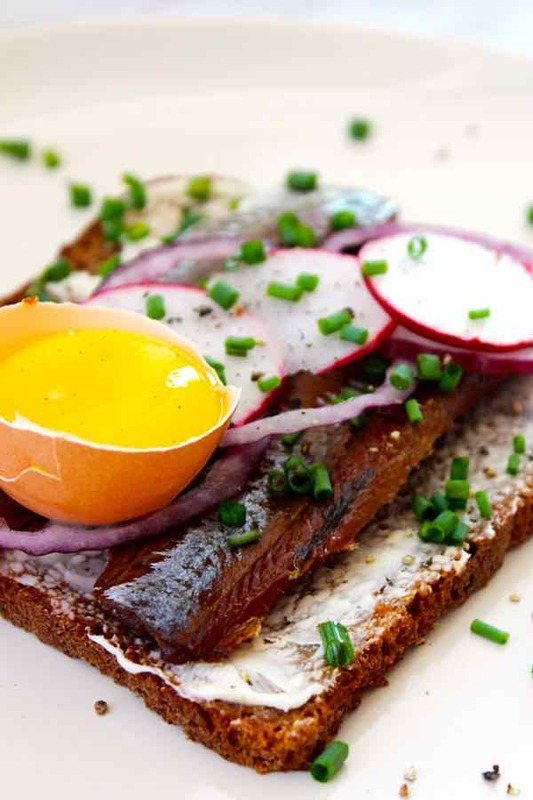 Smørrebrød is a great healthy option for a breakfast or lunch. Sourdough rye bread is widely considered to be a healthier option, it is easier to digest and contains more nutrients than white or wholemeal bread. 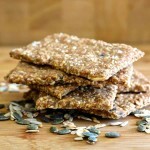 Rye can also help to regulate blood sugars. The smoked herring on the sol over Gudhjem version featured in this post is also full of health benefits. Herring is one of the best food sources for vitamin D and fatty acids that help to prevent heart disease. 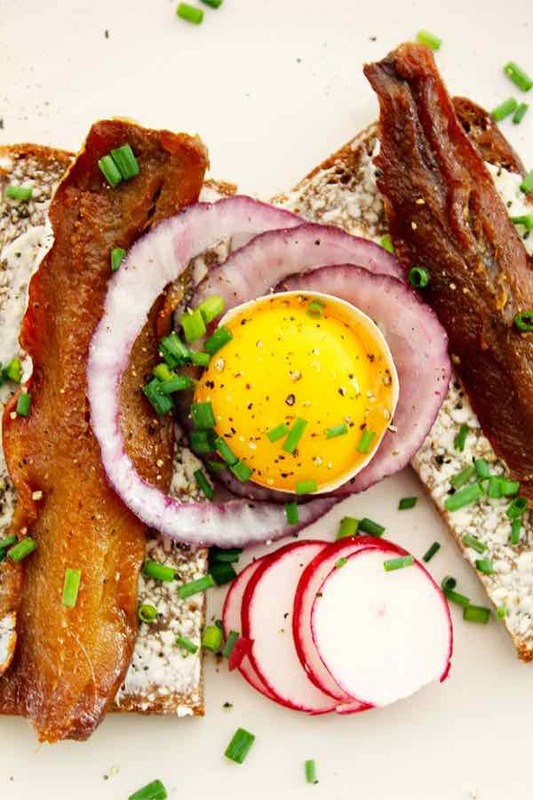 Smørrebrød is an easy and impressive breakfast or lunch. It takes no time at all to make and is a nutritious and hearty meal that will keep you full. It’s also great to serve to guests as a visually appealing plate. There are so many variations for the toppings that you will never be short of inspiration, and the sol over Gudhjem is a great place to start! 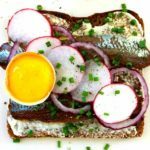 Smorrebrod,‏ "butter and bread" in Danish, is an open faced sandwich prepared with dense rye bread and toppings that can include cold cuts, fish or cheese. Butter the bread slices. Place 2 filets of smoked herring on each of them. 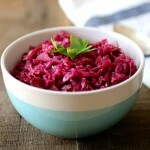 Add thin slices of red onion, sliced ​​radishes, and sprinkle with chopped chives. Place the egg yolk on top, inside a half egg shell for garnish.